If you love the islands and tropical decor then there might be a good chance you also have a love for tiki decor. And if you are anything like our very own Noah here at F.I.N.D.S. then you also have a love for tiki mugs. Noah has quite the collection he has acquired and it is always a great conversation piece when we have guests. 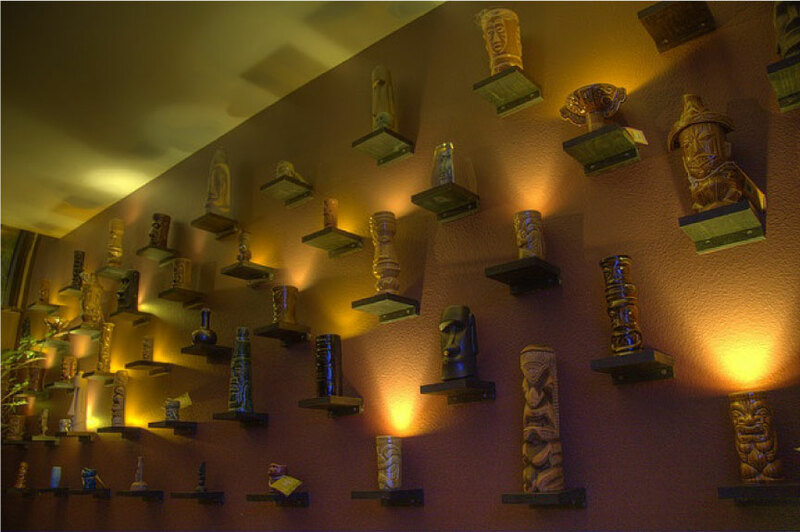 That has got me thinking about all the different way one can display their tiki mug collection. Really there is a way to work it in no matter what your style. 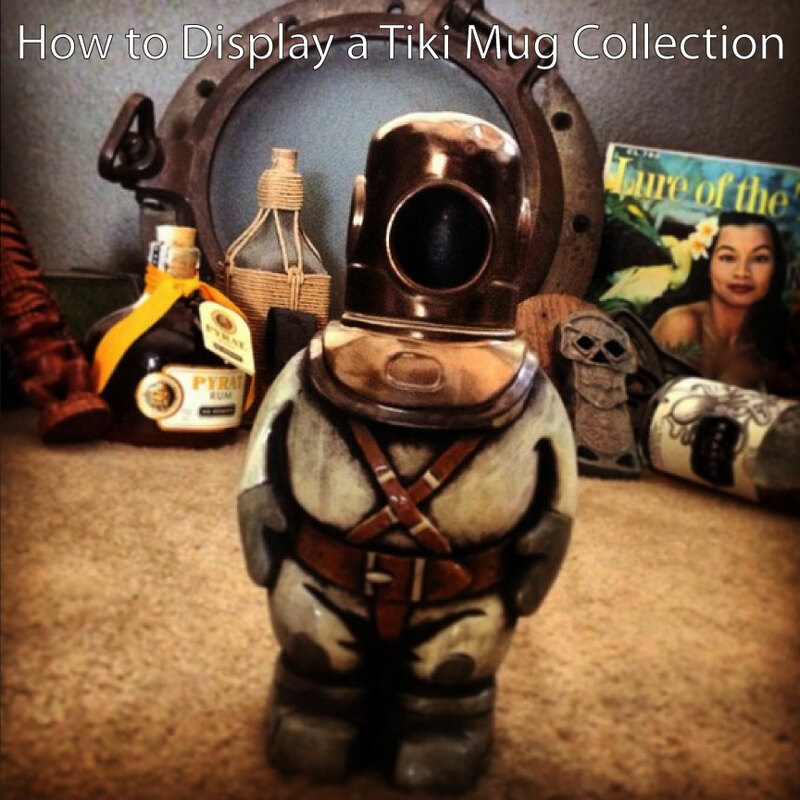 Here are a few ideas to fit a tiki mug collection into your space. Maybe you love the look of the typical tiki bar. You love the look of tons of tiki inspired items all grouped together in the way one would image a traditional tiki bar to look. Take a corner (or the bar area like we have) and add a few shelves to the wall. Complement that with some tiki style art and masks and a tropical bar sign. 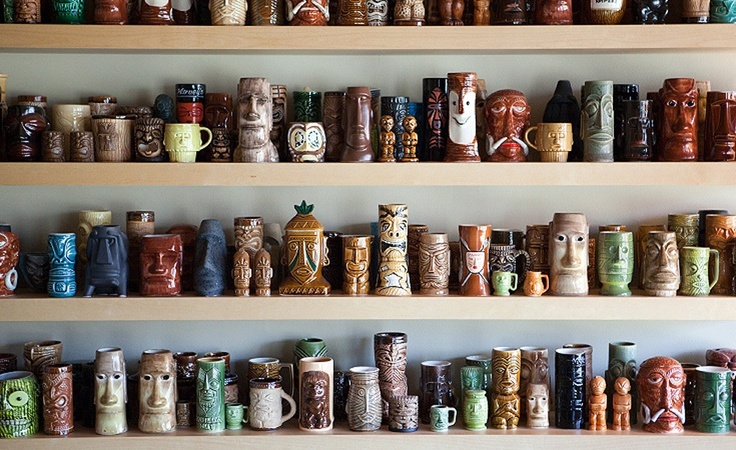 Arrange your mugs as you wish and just let the tiki take over that part of the room. Not pictured is the fantastic mid-century style bar cabinet that is below all this tiki fantasticness. The tiki style pairs great with the feel of mid-century modern furniture and that 1960’s vibe. Another way to display them would be to turn the collection into more of a show piece. Here you see each mug has been set on its own lit shelf to really draw attention to the display. If you have a large collection you could rotate mugs out throughout the year to have an every changing display. 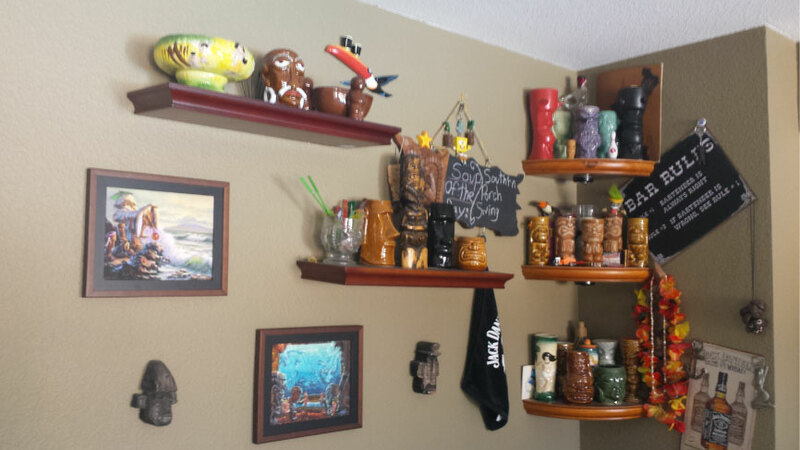 If you have a large area to hang some shallow shelves in you could cover an entire wall in tiki mugs. Group them by styles and colors to create an interesting display that shows off everything you have in your collection all at once. 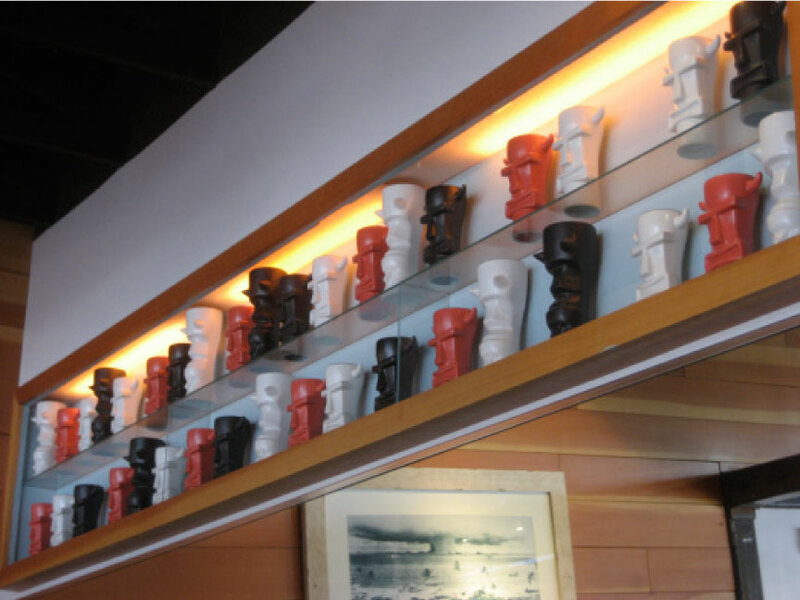 Another way we love (and will eventually use in our own home) is the clean and modern way the tiki mugs are displayed at Hula’s Modern Tiki here in Phoenix. They are lined up in a very modern way on a shelf that has been recessed into the wall. This is a great modern way to display the collection without it looking like you just turned your home into a tiki bar. This method would work as a great way to display in any type of decor. It would fit in as is to any modern space. If you have a more traditional space then display them in more of a wood built-in traditional way like you would see in an older historical home. Hope this gives a few ideas on how to display your collection so you can get it out of storage and in front of everyone to enjoy!